All prices listed on this website include GST and are in Australian Dollars. A Delivery Charge is added to every Order, this amount is displayed at the end of Check Out prior to making payment on your Order. It automatically combines shipping where possible, so feel free to buy additional items and save on shipping. 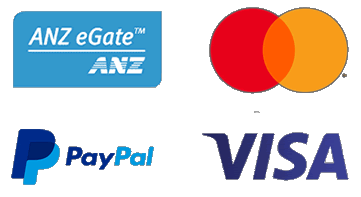 We accept payment by Visa, MasterCard, PayPal Credit, and Bank Transfer via the secure PayPal system. All transactions are transmitted using the highest level of Secure Socket Layer (SSL) encryption. To maximise your security, we also recommend that you use the latest version web browser and security software to protect your PC. Prices listed may vary in store. All orders, where possible (according to size and weight) will be sent via Australia Post registered and receipted. All orders exceeding this size and weight will be shipped using our current freight company and will require a signature on consignment. Customers will be contacted within 12 hours of your purchase with freight cost and a request to confirm. Every product sold by Power Tool Specialists is warranted to be free from defects in material and workmanship under normal use and service for a period of 90 days from the date of purchase. Many of the products that we sell carry a manufacturers warranty that extends beyond this 90-day period. Our warranty does not cover any product or part, which has been subjected to misuse, negligence, or accident, nor does it cover any product that is used for any purposes other than that for which it is intended as stated in the specific manufacturers product information. Any merchandise returned under the warranty must be complete and it its original packaging. Send us an enquiry via the Contact Us page.